Can I hand in my used spectacles? The Optical Foundation nowadays only uses new frames, these are often out-dated models donated by opticians or suppliers. The lenses are ordered at a local factory in Ghana. A Ghanaian optician mounts the customized lenses into the frames and is compensated for this. By doing this we aim to stimulate the local employment and economy. Why are we not using used frames? We understand that many people would like to donate their own used glasses to charity because they think their frames are still in good shape. However especially the case with children spectacles, even though the frame might still look fine, if it has been worn for a long time, itâ s structure would have probably undergone some substantial modifications. This may have caused metal fatigue and an increased risk of breakage. Mounting the lenses puts pressure on the frame and if it breaks, the customized lenses that were made to size, can no longer be used either. Aside from this, research shows that only 7% of the tested second hand frames are suitable for re-use. This is a relatively low percentage that does not outweigh the high transport cost to Ghana. Not to mention the time involved in sorting though the second hand frames to determine which can be re-used. The same research shows that a 10 dollar contribution will achieve more than the donation of a pair of second hand spectacles. All in all, it works out to be far more economical to send new frames to Ghana, which are stronger and allow the children will get a much longer use out of them. Is there a way I can make some sort of contribution with my second hand glasses? We spray paint the glasses orange (Dutch national colour) and sell them at one of the flea markets on Koningsdag (Dutch King’s birthday celebrations) as fun orange novelties. The proceeds from these glasses is used by The Optical Foundation to provide prescription glasses for children in Ghana. So in essence, your old glasses will definitely be contributing to new glasses in Ghana. Can I help to raise funds for The Optical Foundation? The Optical Foundation is always looking for fundraisers. The success of all our projects is totally depends on whether there is adequate funding. Therefore fundraising is a very important task of the foundation. There are a variety of ways to raise money for The Optical Foundation. We can provide you with some suggestions on how to go about it, but you yourself might have some great, very creative and innovative ideas, which we are eager to hear about. 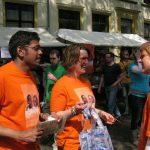 As a fundraiser you are closely involved with our activities in the Netherlands and abroad, and you will see immediately get to see how the money you have raised is being used. If you are interested in becoming a fundraiser, please contact us. The Optical Foundation welcomes optometrists / orthoptists who would like to spend some time in Ghana working on our projects. Your efforts contribute to the sustainability and success of our projects. It’s really a win-win situation: You as optometrist / orthoptist contributing to the objectives of The Optical Foundation, will develop your skills on so many different levels with this opportunity of working in this totally different environment then what you may be used to. Support The Optical Foundation and the children in Ghana! To send a pair of glasses from the Netherlands to Ghana and get it made to prescription costs The Optical Foundation 15 euro for each pair. The children pay 1 euro for their glasses, which is the maximum amount they can afford, leaving an outstanding amount of 14 euro. This is where you can help The Optical Foundation, by donating the remaining 14 euro. The Optical Foundation has been officially added to the Charities and Not-for-profits Commission registry as a charity authorised to fundraise by the (Dutch) tax authorities since February 15, 2011. These charities and Not-for-profits organisations on the registry are termed “Algemeen Nut Beogende Instelling” (ANBI) [translation: General Necessity Benefit Institution], so your donations are tax-deductible.